I stumbled on a number of facts today that put me in mind of the old, venerable debate among labor economists about the extent to which educational wage premiums driven by employers’ increased demands for skills is driving overall wage inequality. It sounds obscure, but it actually has very potent policy implications. Let me try to quickly break it down. –The gap between high, middle, and low wages has grown a great deal since the late 1970s. No secret there. In real terms, this has meant long periods of wage stagnation for middle- and low-wage workers. –At the same time, the earnings of those with college educations have grown a lot relative to those with terminal high-school degrees. Economists interpret this as increasing returns to “skill,” or more wonkily, evidence that technological advances, like computerization in the workplace, are increasing complementary to the skills college-educated workers bring to the job. –But while I solidly subscribe to that admonition, there’s a ton more going on under the surface. For example, anything that drives down the pay of the non-college educated, who still account for about 2/3 of the workforce, also drives up the college wage premium. So, you must try to parse out declining union power, falling minimum wages, weak macroeconomies (the absence of full employment), and more, from the skill-demand part of the story. And this, of course, has major implications for the policies we pursue to close the gap and reverse the wage stagnation for the majority of the workforce. –Moreover, and this part is particularly notable, the college wage premium, while as high as ever, hasn’t grown much over almost two decades. The figure below was in the WSJ this AM, in an interesting piece about how, given the rising costs of college relative to incomes, some kids and their parents are taking a closer look at alternatives like technical/vocational programs. 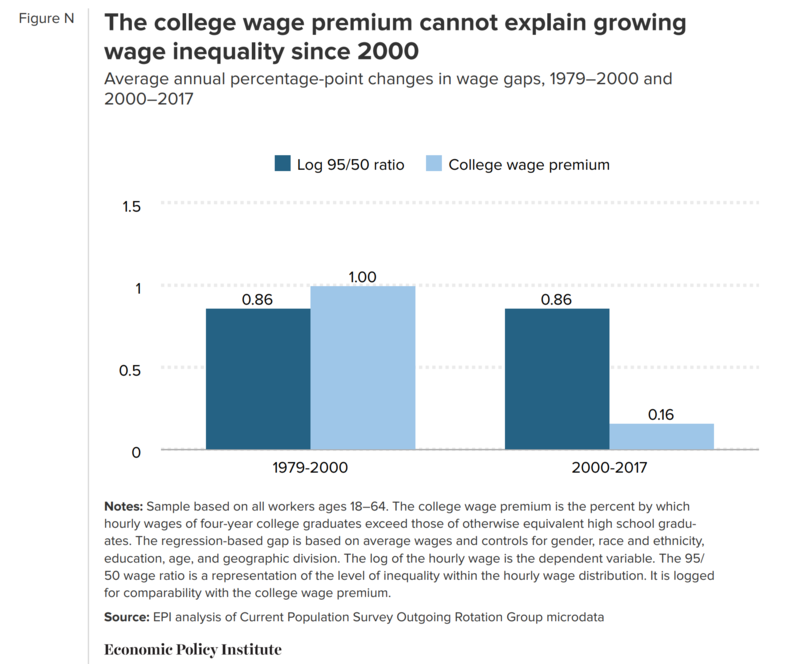 The figure makes two important points: the premium is as high as ever (wage signal: go to college! ), and it hasn’t risen since 2000. The next figure relates to that stable trend, and it’s kind of the punchline, in terms of the facts. It’s from EPI economist Elise Gould’s recent comprehensive wage analysis (I’ve got a piece on her minimum wage by state findings coming out soon) and it takes some unpacking. The dark blue bars of the left show a measure of the growth in wage inequality: the yearly growth of the gap between high (95th percentile) and middle (50th percentile) hourly wages. The light blue bars on the right show the growth of the college premium, adjusted for a bunch of stuff including race, age, gender, etc. (see figure note). Basically, the figure is showing you how much of the growth in the left bar might be explained by the right bar. 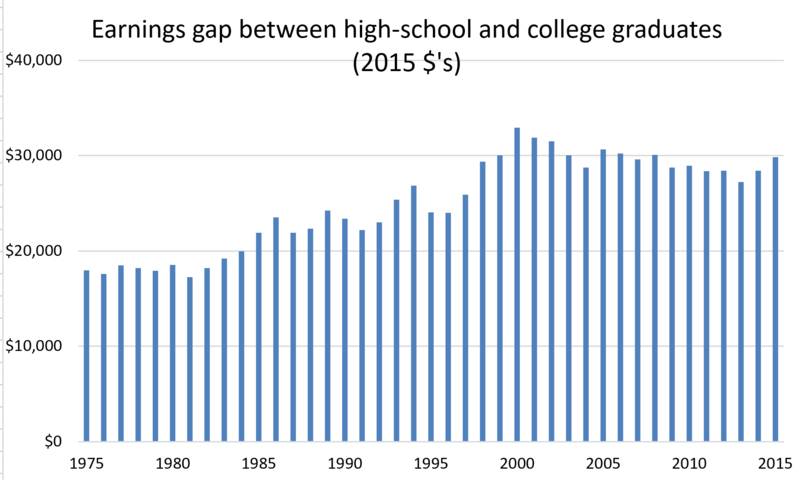 From 1979-2000, the answer is “all of it.” Putting aside my important caveats that it’s not just skill premiums driving the college-HS wage gap, one can certainly look at those trends in the left two bars and call it an education story. You can’t tell that same story, however, for the bars on the right. Though wage inequality by this measure has grown at a constant pace since 1979, since 2000, something other than the college wage premium mostly drove it up. I’ve given you some candidates above, and I’d add over this period: especially large trade deficits and the rise of the finance sector. But the larger point is policy arguments like “it’s all about education” or “if only everyone got a college degree, these wage problems would go away” are simply not supported by the post-2000 data. To be crystal clear about this, higher education remains a critical way up the ladder of opportunity, especially for those groups that are under-represented among college graduates, and robust policies to help them must be a big part of the mix. But we must also pursue policies that strengthen labor standards, worker bargaining power, and full employment. In fact, this two-sided policy mix is the essential combination for pushing back on wage inequality and stagnation. Share the post "College, wages, inequality, and the implied policy agenda"
9 comments in reply to "College, wages, inequality, and the implied policy agenda"
The other issue with the “get more education” solution is that we don’t know if a solution that works for individuals can work for the nation as a whole. Right now, there are X high-wage jobs out there. Having a college degree means you’re more likely to get one of those jobs. That’s great for you. But for policymakers, the goal must be to increase X. Otherwise, for each person whose education gets them into that circle, there’s someone else getting pushed out. The gap stays as big as before. And eventually you start to find that a high-wage job requires a master’s, and then a doctorate – not because the job is that complicated, but because employers now have the luxury of imposing such demands. When management replaces workers with a machine it is because the labor cost of designing, manufacturing, operating and maintaining that machine is substantially less than the cost of the labor replaced. This means that even with perfect and instantaneous retraining, total wage dollars decrease. in a vibrant capitalist environment competition would bring down the cost of goods produced to sustain worker purchasing power. However, in our monopoly economy this is far from the case. New industries cannot rescue us as most of those have extremely low payroll to sales ratios. We are left with a musical chairs economy where, every time the music stops, there are less wage dollars available to purchase the goods produced. We see this in the capitulation on growth of many of our major industries who are now buying back stock with their excess earnings. The drivers causing this are the reformation of monopolies, automation and The Internet. Until we adjust our federal and local governments to deal with this, our economy and political system are at risk. Some of the symptoms of the financial squeeze on working families is that over 50% of K-12 students now qualify for lunch subsidies and a large percentage (30% ?) of families go without one or more meals a month to make ends meet. Such financial pressure triggers the worst of our tribal instincts for survival and makes election of a demagogue possible. There are two economic steps that must be taken in order to restore our way of life. Government control over the allocation of a corporation’s gross profits between payroll and earnings. I recommend that the government set a cap on each corporation’s earnings to payroll ratio based upon their history using W2’s and SEC earnings filings. Any earnings in excess of the cap would be fined at a rate of 100%. Then give the Federal Reserve the power to raise or lower all the caps by up to 1% a year. I’m not sure why we have to only analyze wage gains relative to each other. What we really want to know is how have wage gains at all levels fared relative to the economy overall. That probably can be normalized to some spending power metric. I think we might find that college level wages have stagnated and lower income wages have fallen in the toilet. Incomes at the very top – are going gangbusters! Until about 1980 productivity gains were shared more or less proportionately between capital and labor. Since then the lion’s share has gone to capital. Productivity enhancements in the workplace eliminated lower skilled jobs first. That decreased demand for low skilled labor vis a vis higher skilled. Thus, the education premium. Now productivity enhancements are working up through better paying jobs, decreasing relative demand for labor at those levels. The education premium stopped growing. Please explain, you can’t possibly be claiming prior to 2000 the college wage premium didn’t have anything to do with decline of unions, manufacturing, lower minimums, increased periods when there wasn’t full employment, let’s throw in exploited immigrant workers, all unrelated to your supposedly skilled college graduates. Equally wrong would be to suppose the educated class don’t currently depress wages by those with less education. In fact, the surplus of college graduates is a significant cause of depressed wages for non college graduates. I’ll shout this, college graduate wages can be totally stagnant or declining, and the premium stays the same as they move into jobs not requiring degrees, and displace those without. So you’re wrong about the “college wage premium” when you don’t include this effect. Please reexamine this issue because the discussion is missing basic facts. 1) College graduate wages have been stagnant since 2000. State of Working America reported this in 2007, before the recession even. 2) College graduates are taking jobs that don’t require degrees, large proportions depending on age and experience, but I recall 20 to 30 percent. The EPI reported on this. 3) College graduates are pushing out and displacing non college graduates, as employers will can use the degree as a convenient filter since there are more applicants than jobs. There is a NBER paper out on this within the last few years, I’ve left references to it previously. 4) It should be obvious that 3) follows from 2) and then this increases the number of people looking for work without college degrees, and further lowers their wage demands. 6) Whereas previously the same level of total unemployment still featured a shortage of college graduates, in that case their labor got bid up, and the opposite of graduates displacing non graduates took place. It means some non graduates got jobs that would normally go to graduates. Moreover the whole wage school moved upward with a pulling effect. So there was an opposite effect to the situation that you have now. I’ve written about this before and given references to the data. I would add that although wages are not determined by supply and demand, they are influenced in obvious ways, and relative to different groups. Labor unions transform “price takers” into “price negotiators.” About 20% of our labor force thrives under what could be described as perfect competition conditions. Perfect competition defined simply as being able to extract pretty much the max the consumer is willing to pay for their input to products and services — never mind all that long winded economic definition, right? To raise most our workforce to “price negotiators” our coming blue wave Congress simply needs to mandate union certification and de-certification elections at every private workplace; every one, three or five years, plurality rules on the latter. Should have done decades ago — only way to maintain democracy in America’s unique in all the first world, anti-labor union, labor market. Much of second and third world not fanatically anti-union culture either: Argentina and Indonesia do sector-wide labor contracts for instance. Bottom 40% of US workforce take 10% share of overall income. Mid 40% plus upper-mid 19% (total 59%) take 67.5%. Top 1% take 22.5% — up from 10% over last two generations. See where this is going? … If McDonald’s can pay $15/hr with 33% labor costs, then, Target can pay $20/hr with 10-15% labor costs and Walmart (bless it’s efficient heart) should be able to pay $25/hr with 7% labor costs. Bobby Kennedy’s son Chris is running for governor in the Democratic primary in Illinois. His father wanted to fight poverty — I remember something called model cities — but with only half today’s per capita income I’m not sure what he was thinking. Now, with doubling of per capita income it’s should merely be a matter of sloshing it all around better. The bottom 40% will gently (and persistently) nudge the middle 59% to take back 12.5% of overall income from the top 1% through confiscatory taxes — of the kind we had in the Eisenhower years; and nobody gave it much thought either. With twenty times the personal income going to the same jobs of the top 1% now, this time around we are going to get really serious about confiscation. Bonus: federally mandated certification and re-certification elections automatically the hottest issue (maybe in a hundred years) because transformative in some way for almost every household. Dreadful for Republicans to defend against as it is stealing a page from its own anti-union (state gov unions) playbook.